Natural cycles determine the timing of agricultural work to a great extend. 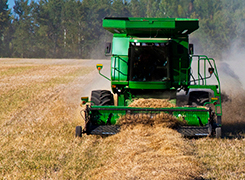 LEGG’s comprehensive range of durable agricultural belts helps minimize down times to make sure the harvest is complete on time every time. The nylon/polyester outer plies coupled with the all polyester inner ply make this an exceptional baler belt. It is resistant against abrasive, UV and ozone. LEGG's patented Flexi-Tooth® pick up teeth for replacement without taking off the belt save much down time. We also offer pick-up belts in the traditional bolt on tine. This belt has integrally molded cleats for strong hold. The 2-ply 100% polyester carcass insures long service life without the chance of rot or stretch. LEGG’s swather canvas features rip resistant side laminate and strong cleat profiles. Smooth running reduces vibration to extend the belt´s service life.